Last minute group hotel rates. The company has had a great year, and now you are tasked with getting the best last minute hotel group rates for that year end meeting. You’re not just planning quickly, you are both planning and implementing at lightning fast speed while remaining mindful of your company’s budget and your group’s style and demands. Better go ahead and pull out your superhero cape, because while last minute hotel discounts are often some of the hottest deals, they also don’t tend to be available in bulk. Oh and by the way, you still have that long Christmas list to start on for your family and employees. Yes, it’s possible. If a hotel does still have group room blocks available for booking this late in the game, then the property may be willing to negotiate. But how do you know which hotels have some versus tons of rooms ready for the taking? For starters, there is the overall size of the hotel to consider. The more rooms, the more likely to have vacancy – – generally. Time to turn to groople for your quick search and results. Oops, let’s take a look at the event calendar. Is there a convention in town or the city that your manager has selected for the meeting? You can probably rule out any nearby hotels. A game that weekend? Steer clear of the stadium. The opposite works, too. No convention in town? That huge convention hotel might really enjoy hosting your last minute off-site. In fact, you may even find some small conference rooms onsite at the hotel at no rental cost since you are reserving guestrooms. Groople to the rescue again, they take all these things into consideration. There is something to be said for going with what is familiar – meaning, reach out to the hotel that you’ve done business with for prior group meetings. They’ll remember you, your group, and all of your group’s specific quirks and needs. Or, maybe it’s time to try that newly renovated hotel whose rates all of a sudden seemed out of reach. They might just be open to taking your last minute group now. Finding the right hotel at the right rate with the right amenities takes time. 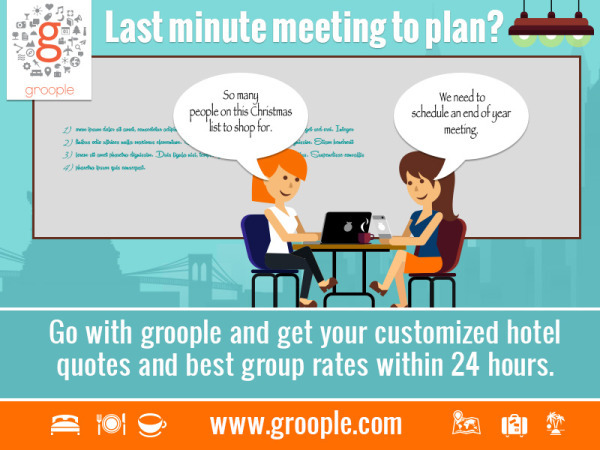 Call a group travel expert at groople and let them do all the negotiating for you, and make you look like the superhero that the entire office already knows you are.